For the amateur golfer who plays of a high handicap, few prospects in the game of golf offer them more dread than a typical bunker shot. Of course, that shot at the first tee, particularly if there is a crowd watching, is always likely to be the biggest nerve jangler of the round – The only exception being unless you have a putt to win your monthly medal. But during the course of a typical round nothing makes the heart sink than seeing your tee shot or approach plop into the sandy hell of a greenside bunker. I have playing partners who can run up basketball scores trying to hit out of the bunker. I’ve seen my brother, a more accomplished golfer than I, take 10 to get out of one bunker at a local course. Yet for all my faults in golf (and I have many) playing duff shots out of the bunker is not something I do very often and I put this down to some great advice I was given when first starting out in the game. Back then, I was a dreadful bunker player. 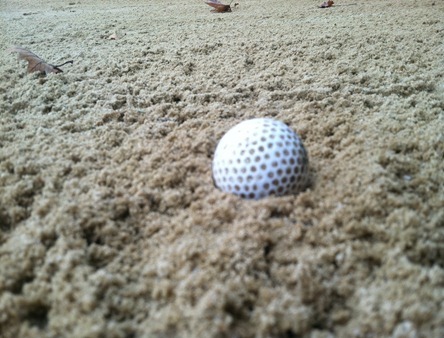 I’d thrash the sand and the ball would stubbornly refuse to leave the bunker. That was when a more experienced golfing friend gave me three key pieces of advice about playing out of a bunker which have stayed with me ever since and which I have passed on, to varying degrees of effect, to other learners having problems in the sand traps. Bunkers come in all shapes, sized and conditions. 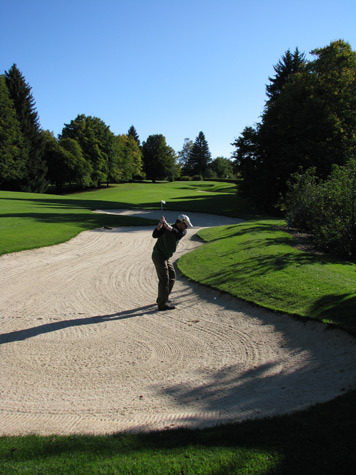 Depending on the time of the year, the sand can be hard, wet and compacted so it it almost like playing from the fairway, at other times it can be fine, dry and powdery and seemingly ready to swallow any errant ball hole. Judging the condition of the bunker is important but unless the bunker really is badly compacted enough so you can play a simple pitch shot without a problem, I’d tend to play a bunker shot if there is any give in the sand underfoot or around the ball. 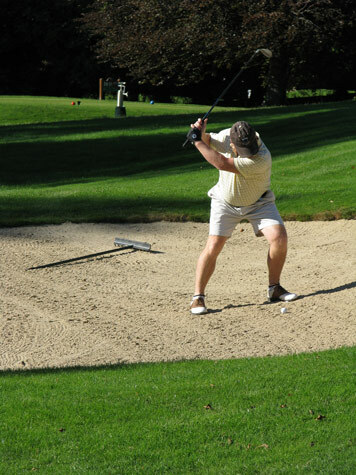 Considering the type of sand you face in your bunker is the first thing to consider about your lie, the second is how the ball lies, specifically, whether it is plugged in the bunker or not. 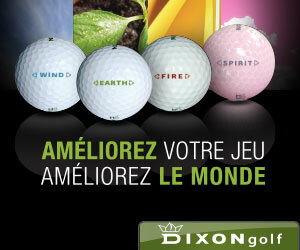 A plugged ball is much more difficult to play, with a far less certain result. I do follow the same procedures, but I tend to strike the ball harder and slightly further behind than I would a non-plugged ball, to get the club sliding through the sand, under the ball and to get the ball elevated. Most of the time, you’ll find your ball hasn’t plugged, in which case you now need to consider the type of shot you need to play and get into the stance ready to play it. A key skill here is the ability to visualise the shot you want to play. Run the shot through your head, work out where you want the ball to land, how hard you’d need to hit the ball to achieve that and then mentally rehearse the shot in your mind (no practice swings in a bunker remember!). The clearer you can visualise the shot, the better. Once you have a clear understanding of the shot you want to play, it’s time to get into the bunker. I find that the more a player focuses on the negatives here, the worse the shot that follows. So once you have got into the bunker, get into your stance and play the shot quickly. The stance that works for me is a slightly open stance, seemingly hitting away from the hole with the club face open (with my wrists slightly tilted back) that tends to send my ball right of the target, so to compensate, I aim slightly left of it. I pay close attention to my grip here, ensuring my wrists are locked back to ensure the club face remains open and then once I am ready and my body is in position, I run through what I want to do in my head once more and I’m ready to play the shot. 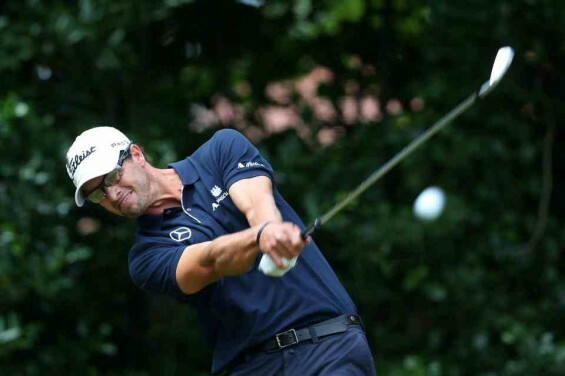 Playing the shot starts with a controlled swing. I don’t swing the club back too quickly as I find that if I do, my downswing is more erratic. However, when I bring the club through, I maintain the speed I selected for the shot throughout the swing, hitting down through the sand, under the ball and then into a semi-curtailed finishing position. Usually, this results in the ball flying out of the bunker and while it may not always go where I wanted it to, I usually get the ball back onto the putting surface, or at least close to it. The key point here which so many amateurs do, is not to decelerate to try and control the distance of the shot. Keep a single pace and work hard on the range to ensure you are hitting sand first, then ball, to ensure you get the club underneath it. If you do, then those dreaded ‘top shots’, which see the ball remain in the bunker or clatter into the walls of the bunker before coming to rest back at your feet, will be a thing of the past.